Make short work of cleaning heavily fouled AR-15 upper receivers, right down to the locking lug recess. Specially sized and shaped bronze receiver brush and wool mop quickly loosen stubborn carbon residue from the bolt carrier way and locking lug recess. Standard Kit for cleaning upper receiver, bolt carrier way. Deluxe Kit features a longer rod and a chamber brush that lets you thoroughly clean the bolt carrier way, plus the chamber and locking lug recess. SPECS: Standard Kit includes bronze receiver brush, wool mop, and brass cleaning rod with plastic handle. Overall length - 6½" (16.5cm) long, threaded 5/16"-27 tpi. 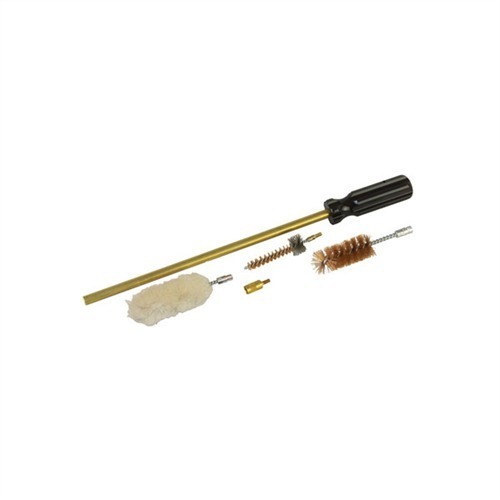 Deluxe Kit includes bronze receiver brush, wool mop, AR-15 chamber brush, thread adapter and brass cleaning rod with plastic handle. Overall length - 14¼" (36.2cm) long, threaded 8-32 tpi. Gjøre kort prosess med rengjøring tungt fouled AR-15 øvre mottakere, helt ned til låsing slepe fordypningen. Spesielt størrelse og formet en mottaker børste og ull mopp fort løsne sta karbon rester fra bolten carrier måte og låse lug fordypningen. Standard utstyr for rengjøring øvre mottaker, bolt carrier måte. Deluxe Kit har en lengre stang og kammer pensel som lar deg grundig rent bolt carrier måten, pluss kammer og låse lug fordypningen. Spesifikasjoner: Standard Kit inneholder en mottaker pensel, ull mopp og messing rengjøring stang med plast håndtak. Samlet lengde - 6½"(16,5 cm) lang, gjengede 5/16"-27 tpi. Deluxe Kit inneholder en mottaker pensel, ull mopp, AR-15 kammer pensel, tråden kortet og messing rengjøring stang med plast håndtak. Samlet gjengede lengde - 14¼"(36,2 cm) lang, 8-32 tpi. The brushes clean the AR-15 perfectly. And the wool mop is perfect for a final cleaning of the upper receiver. Used for regular cleaning of my AR chamber. The wool mop left lots of lint in the rifle. The cotton mop works better without leaving lint. When first received, the handle could twist on the shaft when I tried to rotate the brush to clean the chamber. I drilled a 1/8" through the handle and shaft where where the handle narrows. Then I drove in a 1/8" dia. x 3/4" long roll pin to prevent the handle from rotating so I could turn the brush to scrub that chamber. It worked out very well. Brownells should consider makiing this modification the to handle. The handle and brushes work great, but the wool mop sheds way too much. Although I haven't tried the one with the cotton mop, I'd suggest getting that one instead. Does its job as what is it supposed to do. Previously I use q-tips and surgical forceps cleaning the locking lugs and barrel extension. This cleaning tool is easy to use and quickly cleans out the crud accumulated on that area with just a few turns. I though I could use my pistol bore cleaning rod, but it is too short to clear the end of the upper receiver. This is really useful for cleaning my upper receiver. The included handle is also very well made and sturdy feeling. Overall I would say that this is a great value. This plus a boresnake is all you need to clean your upper. Deluxe Kit, Wool Mop Gjøre kort prosess med rengjøring tungt fouled AR-15 øvre mottakere, helt ned til låsing slepe fordypningen. Spesielt størrelse og formet en mottaker børste og ull mopp fort løsne sta karbon rester fra bolten carrier måte og låse lug fordypningen. Standard utstyr for rengjøring øvre mottaker, bolt carrier måte. Deluxe Kit har en lengre stang og kammer pensel som lar deg grundig rent bolt carrier måten, pluss kammer og låse lug fordypningen. Standard Kit, Cotton Mop Gjøre kort prosess med rengjøring tungt fouled AR-15 øvre mottakere, helt ned til låsing slepe fordypningen. Spesielt størrelse og formet en mottaker børste og ull mopp fort løsne sta karbon rester fra bolten carrier måte og låse lug fordypningen. Standard utstyr for rengjøring øvre mottaker, bolt carrier måte. Deluxe Kit har en lengre stang og kammer pensel som lar deg grundig rent bolt carrier måten, pluss kammer og låse lug fordypningen. Deluxe Kit, Cotton Mop Gjøre kort prosess med rengjøring tungt fouled AR-15 øvre mottakere, helt ned til låsing slepe fordypningen. Spesielt størrelse og formet en mottaker børste og ull mopp fort løsne sta karbon rester fra bolten carrier måte og låse lug fordypningen. Standard utstyr for rengjøring øvre mottaker, bolt carrier måte. Deluxe Kit har en lengre stang og kammer pensel som lar deg grundig rent bolt carrier måten, pluss kammer og låse lug fordypningen.